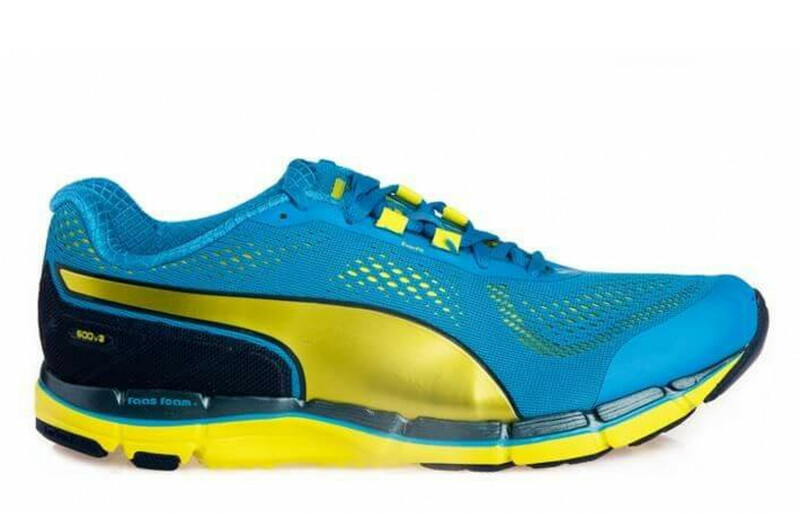 Puma Faas 500 Reviewed - To Buy or Not in Apr 2019? The Puma Faas 500 is now in its fourth iteration due to the popularity and versatility of the very first Faas 500. The first Faas 500 boasts extra traction and grip, making this a great shoe for not only speed work and setting new PRs in shorter races, but also for a wide variety of dynamic activities and movements. The lower drop platform combines a more stable base with added cushioning and a unique rocker technology that helps to propel the foot forward, helping the runner increase their speed with less effort and an overall improved gait cycle. Weight is distributed evenly throughout the gait cycle and helps runners move from heel striking to a more natural, healthy movement. 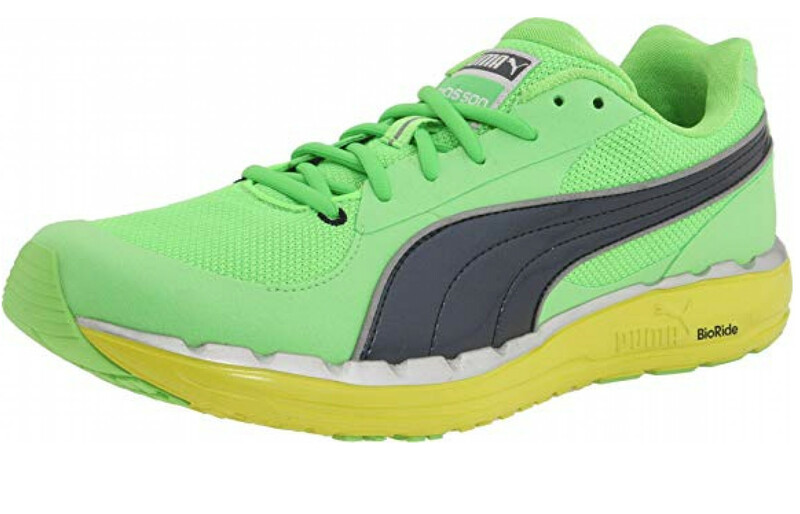 As is the case with all Pumas, the Faas 500 sports a sleek design and stylish upper. These shoes are designed to assist athletes with their workouts and races, but this shoe looks just as good as part of a stylish outfit as it does crossing the finish line of a local 5K. Overall, runners liked this shoe as a solid minimalist trainer that won’t break the bank. The outsole of this shoe is designed to provide added grip and traction for runners. If runners flip the shoe upside down, they will notice the unique grid pattern to the underfoot. This design mimics a more subtle lug design, and when combined with a durable rubber and Evertrack technology, runners reported an almost sticky ride. Additionally, the outsole is outfitted with flex grooves to increase the shoe’s ability to move with the runner. The entire midsole of the shoe rests on top of a unique rocker design. The rocker technology is designed to support the natural movement of the runner. It evenly distributes pressure throughout the foot, propelling the runner forward. It works to improve the gait cycle, helping runners to resist the urge for painful heel strikes. 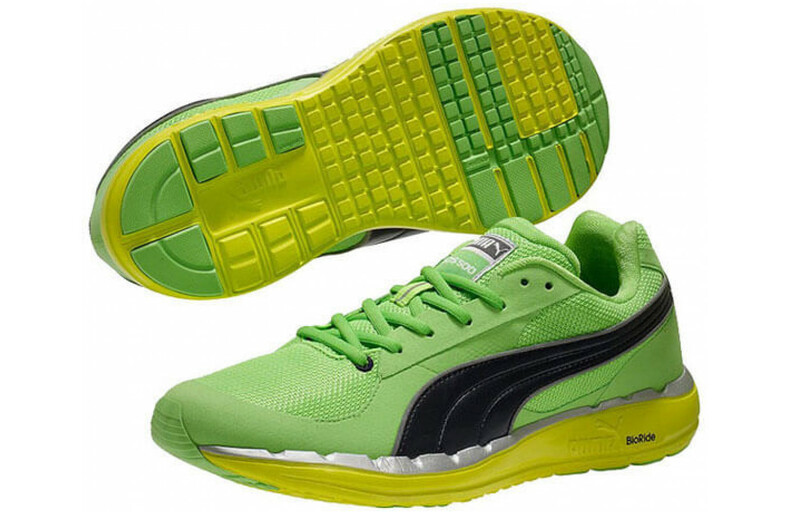 The midsole foam used in this shoe is Puma’s patented BioRide foam. This foam is designed to be cushioned and also highly responsive. This midsole comes equipped with grooves along the side to increase stability. For an added layer of cushioning and protection, Puma included an Ortholite Dual Layer Sock Liner. The upper of the original Faas 500 is made using a combination of mesh and synthetic suede. The mesh is lightweight and breathable, helping to keep the runner comfortable. The synthetic suede overlays create a unique look, adding to the overall style of the shoe, but they also act as a built-in support for runners. These overlays help keep the foot in place, reducing the risk of blisters. The interior of the shoe is also lined with a mesh liner. In addition to the bright, stylish colors found on the upper, this shoe is designed with reflective details to keep runners safe during their evening workouts. This shoe is considered a lightweight running shoe by all standards. Puma made sure to only include the most important technologies and materials to ensure that the shoe is spry and springy in its movement. The men’s size nine is a mere 9.5 ounces. The lightweight nature of this shoe makes it a good choice for speed work, for short, fast races and for cross training that involves dynamic motions like Zumba or Parkour. Runners reported that they were able to PR in these shoes, in part, due to the lightweight fit and feel. The combination of reflective mesh and synthetic suede create an upper that provides a decent amount of breathability. Runners commented that the lightweight mesh has visible breathability that promotes circulation and ventilation. This material can be found over the toe box and along the sides of the shoe. However, the suede overlays that run around the outside of the toe box and along a section of the sides of the shoe are much better at supporting runners than providing ventilation. The end result is a shoe that is ventilated enough to keep runners comfortable, but not so breathable that runners are completely protected from hot spots. This shoe includes a variety of details that include its overall comfort. The Bioride midsole foam provides a cushioning that adapts to the shape of each runner’s foot. This makes it compatible with all arch types. Additionally, Puma included an Ortholite dual layer sock liner. This sock liner works to wick away sweat, and provide the runner with an added layer of cushioning. Although it may seem like a small detail, with this shoe Puma includes shoe laces that stay tightly tied so runners don’t have to worry about that detail during their workouts. Puma is known for expertly blending style and function. The Faas 500 combines bright, unique color combinations with a sleek, thin design that provides runners with a high quality running shoe that can double as a fashionable accessory. Runners commented that this shoe looked as good with jeans as it does with workout clothing. Since it is an older model, color options are limited, so don’t expect a wide selection. What colors are available are eye-catching and unique, so this is not the design for runners who are looking for a more subdued look. Runners raved about the overall durability of the Faas 500. Reviewers commented that the shoe can last for more than 350 miles without losing its shape and effectiveness. The upper of the shoe has strategically placed synthetic suede overlays atop the mesh material. This helps to protect the shoe from the elements and reduces the risks of the upper tearing or shredding as it gets older. The Ortholite dual layer sock liner consists of multiple layers for added cushioning and the sustainable materials used in its creation are long-lasting and won’t lose their shape. Finally, the Evertrack outsole is designed to withstand aggressive mileage. The heavy-duty rubber used on the outsole helps the shoe stay newer for longer. Runners were pleased that they did not need to replace these shoes as often as they did with other brands and models. Runners can expect to find protective details in a few different places in this shoe. For starters, the mesh upper incorporates reflective details. These reflective details are designed to help the runner stay visible in low light and during evening runs and workouts. The stay tied lace system also helps to protect runners from trips and falls. The Rocker design of the entire shoe helps protect joints by supporting a natural rocking movement that reduces the impact on joints. Likewise, the added grip found in the outsole helps keep runners upright and protected on varied terrains and even in slippery conditions. One of the reasons why runners love this shoe for speed work and athletes love it for dynamic, high impact workouts is because it is a highly responsive shoe. The lightweight materials of the midsole, though cushioned, help the runners feel connected to the ground below them. To add to this high level of responsiveness, Puma added in unique grooves along the sides and outsole. The Evertrack outsole design increases grip which also helps to increase the overall responsiveness of the shoe. It is no surprise that this shoe receives rave reviews from Parkour athletes as well as runners. The Faas 500 offers support to the runner in a variety of ways. For starters, the synthetic suede overlays that are layered atop the mesh upper help to keep the foot in place. This reduces the risk of unwanted movement that can lead to chaffing and blisters. Another supportive detail of this shoe can be found in the lower drop execution. This gives the runners a more solid landing platform. This more even platform helps to support runners through their gait cycle. This shoe can handle nearly any terrain. The shoe is designed for pavement, but runners reported that the increased grip and responsiveness make it a good option of various settings. Runners reported feeling more secure during track workouts including bleacher climbing due to the added grip. This shoe has enough durability and traction to handle groomed trails too. This shoe is also a favorite in the gym for group fitness classes that require dynamic movement. The price of these shoes is more than reasonable. Runners were pleased to see that this shoe comes in slightly lower than the average high-quality road running shoe on today’s market. This can be attributed to the fact that the Faas 500 is the oldest version of this shoe, so as long as runners don’t mind losing out on a newer model, this is a good option for saving a few dollars. One of the unique features that really sets this shoe apart from similar shoes on the market is the high level of grip and traction provided by the outsole. The outsole of the Faas 500 relies on Puma’s Evertrack technology and a unique design to give the shoe its grippy, almost sticky feel. The underfoot is designed using a grid pattern that is inspired by a lug system design. It also has multiple flex grooves that allow water to run between the grooves instead of pooling on the surface. This detail makes this shoe good on an all surfaces, even slippery ones. This shoe is designed for the athlete who is looking for a flexible shoe that will move with them. The rocker design of the shoe supports the proper, natural movement of the runner, helping runners move away from a heel strike running gait and instead supporting them through a smooth transition. Overall, this is a good option for the runner looking for a minimalist running shoe. The Faas 500 is not designed as a stability shoe, but runners found that the support through the midfoot helped to improve their gait, switching them from heel strikers to more natural toe-off runners with a smooth transition. With that being said, this shoe is not suited for runners who have serious issues with over or under pronation. This shoe lacks the technology to keep a foot from rolling inward or too far outward during the gait cycle. The Faas 500 is a shoe that has a lower drop and is able to appeal to the runner who is looking for a cushioned, minimalist shoe. Due to the lower drop of this shoe, runners should be prepared for a bit of an adjustment and will need time to get used to these shoes if they are used to running in a traditional drop shoe. Overall, runners who are looking for a cushioned, minimalist shoe that will help to restore their natural gait cycle will find a perfect shoe in the original Faas 500. This shoe is the ideal companion for a runner who is looking to set a new PR as the shoe is very lightweight, responsive, and provides the runner with a forward push through the rocker technology. This shoe comes with a lightweight, breathable upper, helping to ensure that the runner stays cool and comfortable regardless of the weather. The cushioned, responsive midsole foam provides comfort and a smooth ride. This shoe is offered in bright, vibrant colors and is sure to get compliments on the track or even as an accessory to a stylish casual outfit around town. Since this shoe is the oldest model in the Faas 500 line, runners will be able to get it at a bargain. This high level of durability and the affordable cost make this shoe an overall great value.